Last week it seems the news was all French. 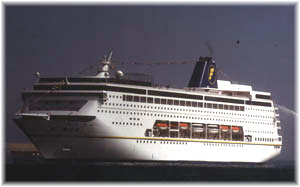 Croisières de France announced a replacement for its Bleu de France in 2012. 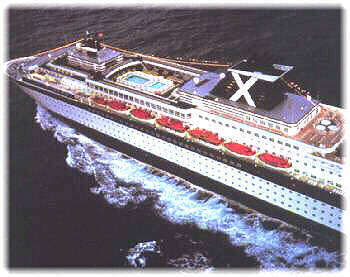 And Croisières Paquet announced a larger and newer replacement for the Costa Allegra in 2011. Meanwhile, CMA CGM made a number of announcements. In addition to a new Round-the-World cargo-passenger service, it disclosed that it was open to taking on a partner in Compagnie du Ponant, its cruising operation, and the sale of a 20% interest in the parent company to the Turkish Yildirim Group. In the UK, meanwhile, a company called Jetline Cruise is introducing new "no fly" packages to the US. Now that Croisières de France's Bleu de France has been confirmed for delivery to Saga in November 2011, a new ship will be required for the French cruise lines' program from Marseilles. That ship, according to sources, will be Pullmantur's Horizon, which was built for Celebrity Cruises, but will be marketed on the French market as L'Horizon. Latterly operating as Pacific Dream, she has had her name switched back to Horizon for her winter charter to CVC in Brazil. 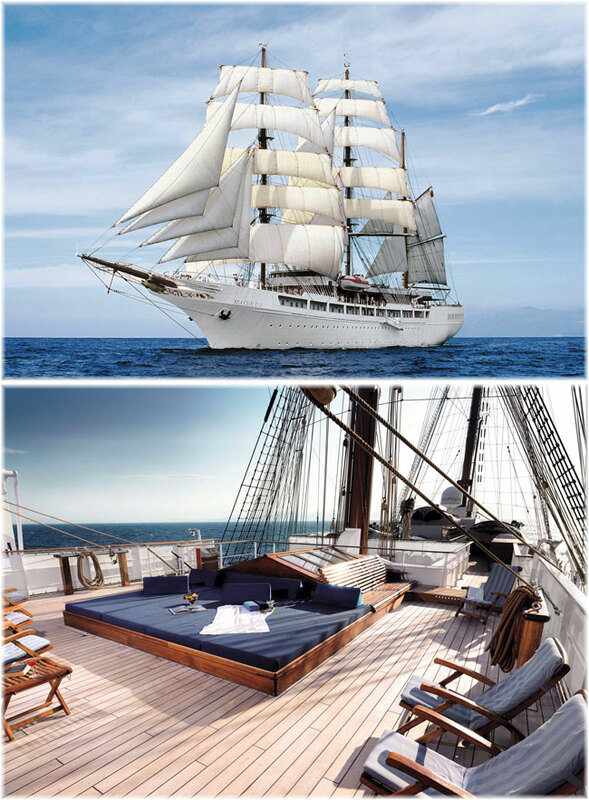 Like the Bleu de France, L'Horizon will have 80% outside cabins but she will also have 68 cabins with balconies. CDF, which is ultimately owned by Royal Caribbean, claims that it will carry 35,000 passengers in 2010, 25,000 of them in the Mediterranean where occupancy reached 100% during the summer, up 25% from 2009. Another 7,500 passengers sailed in the Caribbean on Pullmantur's Pacific Dream and the rest on Pullmantur's Sovereign. This is about 10% of the present French cruise market. While Med numbers may have been up 25% this year, CDF is still seeking some pretty ambitious growth by targeting 60-70,000 passengers in 2012. This would give them about 15% of the French market, putting them third behind Costa and MSC, but it also means raising their bookings by between 70% and 100% over present carryings. Meanwhile, over at Carnival Corp & PLC, the French brand Paquet, owned by Costa since 1993, was revived this year after a break of more than a decade, since the sale of the Mermoz. The program was headed up this summer Marseilles-based tour operator TMR, who chartered the Costa Allegra for the purpose. For 2011, however, it has announced that it will use the larger Grand Mistral, to be chartered from Iberocruceros, another part of the Costa Cruises Group. TMR's Jean-Maurice Ravon indicated that the Grand Mistral would provide them with a better ship for the French market as she not only has 100 veranda cabins but is also equipped with two dining rooms, so that those is the higher grades of accommodation will be able to dine independently. The ship will also be of interest in the French market as she was built in France in 1998 at the then Chantiers de l'Atlantique. 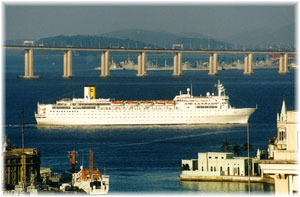 Although both lines operate from Marseilles, a key difference is that, even if it charters its ship to Brazil each winter, Royal Caribbean's Croisières de France is a dedicated French cruise ship operator while Carnival-controlled TMR-operated Croisières Paquet operates a smaller number of themed cruises each summer. 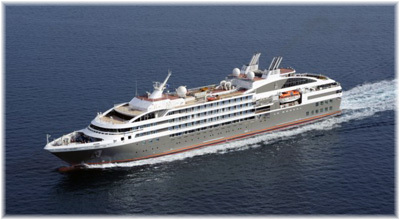 The Allegra offered eleven cruises in 2010 while ten, including four theme cruises, have been announced for the Grand Mistral in 2011. All in all, however, after the huge growth in crusing in neighbouring Italy and Spain, these developments make one wonder if the long-dormant and miniscule French cruise market is finally beginning to wake up. Although the UK surpassed 1.5 million and Germany a million last year, Italy hit almost 800,000 and Spain 600,000, France still didn't even manage to reach 350,000. Estimates for the French market for 2010 are 400,000, or a rise of about 15%, so there's still a long way to go. In a different market, Marseilles-based CMA CGM last week announced the introduction of a new 76-day Round-the-World cargo-passenger service on six British-flag cargo ships. The ships, the CMA CGM Blue Whale, Dolphin, Florida, Kingfish, Swordfish and Tarpon, are 5,100 TEU (twenty-foot equivalent) container ships, completed in 2007-08 and registered in London. Starting in New York, the ships will head for the Far East via the Suez Canal, calling en route at Tanger Med in Morocco, and Jebel Ali, twenty miles from Dubai, before proceeding to Singapore. Once in the Far East they will call at Singapore, Hong Kong, Chiwan, Shanghai and Pusan before returning to North America by way of Balboa, Panama, and then trading up the US coast via Houston, Mobile, Miami, Jacksonville, Savannah and Charleston to New York. Each ship has three double cabins, complete with private lounge, refrigerator, desk and chair, and en suite facilities. Passengers are also able to avail themselves of a swimming pool, deck chairs, shipboard library, table tennis and television and DVD player, as well as a daily newspaper. Passengers will be able to board at any port of call and disembark where they wish with fares paid per day. The ocean transits are 9 days from New York to Tanger Med, 14 days from Tanger Med to Jebel Ali, 12 days from Jebel Ali to Singapore and 17 days from Pusan to Balboa, with the rest of the time spent coasting between ports in Asia and on the American coast. Fares for the full 76 days start at &eeuro; 7,600 per person double, &eeuro; 9,120 for single passengers, including full board, dues and taxes. Complimentary French table wine is included with lunch and dinner. Part passages are also available, with fares based on the number of days spent on board at &eeuro; 100 per person per day double and &eeuro; 120 per day for singles (higher fares apply to voyages of 10 days or less). A number of other new cargo-passenger routes were also announced by CMA CGM last week. A New Cruise Partner For CMA CGM? Meanwhile, through its investment in Compagnie du Ponant, CMA CGM is directly active in the cruise market, with the 264-berth newbuildings L'Austral and Le Boréal, as well as the existing 226-berth Le Diamant, 90-berth Le Levant and 60-berth Le Ponant. The two new Ponant ships cost $300 million in total, which would pay for five or ten new container ships, depending on size - even Maersk Line's proposed new 18,000 TEU giants, which would be the world's largest, would only cost $100 million. However, Le Boréal was introduced to great plaudits this summer from those who experienced her. And despite the small size of its ships, Ponant will carry more cruise passengers in its year-round operation than a reborn Paquet with limited summer departures. Ponant is also ramping up very quickly. The 528 berths in its new ships, when added to the 376 in its three older ships, will bring total capacity to 904, for an increase of almost two and a half times in a very short period. Perhaps with this in mind, Rodolphe Saadé, CMA CGM chief executive, was quoted last week as saying that cruising is actually "marginal" to CMA CGM's mainstream business of containers, ports and shipping, and that they were looking for a partner to join them in the sphere of cruising. As well as Compagnie du Ponant, CMA CGM's tourism operations include tour operator Tapis Rouge, which also sells Silversea and Sea Cloud. The cruise and tourism operations are housed in the original CMA building in Marseilles' Prado district while the container line is based in the new 33-storey CMA CGM Tower, designed by London-based architect Zaha Hadid to resemble a ship's bow looming over the Port of Marseilles. Hadid was the 2004 winner of the Pritzker Architecture Prize, supported by the Pritzker family of Hyatt fame, who are also major shareholders in Royal Caribbean. CMA CGM's container fleet of 390 ships is massive compared to Ponant's modest five-ship cruise operation. However, Germany's small ship Sea Cloud and River Cloud operations are also part of a large shipholding group, Hansa Treuhand, which controls about 70 ships. And the container trades have shown some signs of strengthening recently. Whether an interested party might yet come on to the French cruise scene is therefore unknown but one industry source last week said that CMA CGM had already been shopping at least one Ponant ship, Le Diamant, for a couple of years now. As these various items of news broke, it is public information that CMA CGM has been seeking additional investors from outside. While said to be profitable once more, the company is nevertheless saddled with huge debts. Last week, however, it was also announced that the Istanbul-based Yildirim Group would take a 20% interest in CMA CGM for &eeuro;500 million, along with three of the ten seats oin the board. Yildirim owns Yilport container terminal near Istanbul (where CMA CGM is a large client), Marmaris Shipyards and Yilmar Shipping, operating a small fleet of chemical tankers, a couple of coasters and a tug, but more than that the Yildirim Group is a major industrial player in Turkey. Outside of France, UK-based Jetline Cruise, a company with the word "jet" in its name, is ironically offering a 29-night "no fly" cruise and tour package from the UK to the US next April. Jetline's clients will catch Cunard Line's Queen Mary 2 from Southampton on April 19 for a 7-night crossing to New York. Once in America, the no-flyers will spend four nights in New York before catching a train on to Washington. After three nights in the nation's capital, they will be accommodated in private roomettes for the overnight Amtrak sleeper train from Washington to Fort Lauderdale. A final two nights in America will be spent in a beach hotel in Fort Lauderdale before boarding Royal Caribbean's Jewel of the Seas for a 12-night crossing back to England, at Harwich. Ports of call en route will include Ponta Delgada, Azores, and Brest and Cherbourg in France. It is not very often that a tour of the United States includes France and the Azores, but we must offer our compliments to Jetline for being able to come up with such a novel itinerary. Fares start at &epound;1,999 per person and range up to &epound;2,499 for balcony accommodation on the two ships, which seems pretty good value for almost a month away. 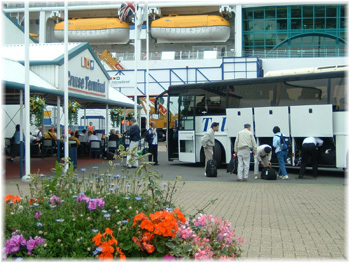 A similar 29-night summer package leaving Southampton on July 5 in Holland America's Rotterdam (see The Cruise Examiner last week) and returning in Queen Mary 2 starts at &epound;3,199, up to &epound;4,299 for balconies on both ships. And of course Cunard Line has for years been offering a number of "sail both way" packages on its own Queen Elizabeth 2 and now Queen Mary 2.